Our fall activities have been what we have predominately done for school time recently. 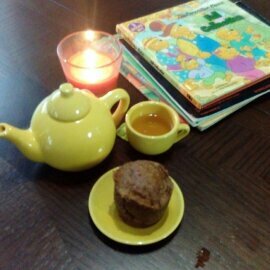 One wonderful aspect of homeschooling the early years is the ability to adapt concepts into fun themes! My goal, as always, is to present concepts in a fun, hands-on manner (with lots of reading as well!). 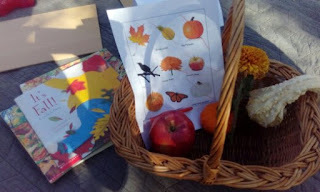 The following are the activities we did to learn while also celebrate the fall season! We brought along this activity on a trip, and enjoyed it with the company of a cousin. It's such a simple and fun activity for learning colors! 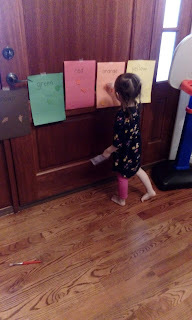 For this activity, I wrote the names of the colors on construction paper and taped them to a wall. 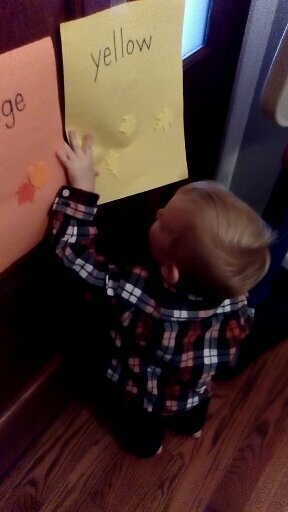 The children were then handed a foam leaf sticker, which they then ran to place it on the matching paper. (This activity doubles as gross motor skill activity! Perfect for energetic little ones!). A salt tray allows children to learn to form letters/numbers/shapes etc. even before their fine motor skills are developed enough for proper pencil grip and writing. I chose pumpkins for our letter cards. I found an image online and printed it out on orange paper, and then wrote each letter. Finally, each pumpkin was run through the laminator to add durability so that we can continue to enjoy the activity in the future. (A far less time consuming approach would have been to purchase die-cuts as would be used on a classroom calendar or bulletin board. I may do this in the future because it was a lot of cutting. haha). For the salt, I decided to color it orange to match the pumpkins. For another tie to pumpkins, I used pie plates as the trays (as in pumpkin pie, get it?). To use: Simple select a card. Demonstrate how the letter is formed. Allow the child to try. Shake the tray to practice another letter. I really like the idea of the children being able to learn the shape of the letters even while their fine motor skills aren't quite developed enough for proper pencil grip and writing. However, I have been a little hesitant to introduce a salt tray as I imagined salt being tossed everywhere. (We've not had great success with sensory bins). However they were so engaged in this activity that they didn't just play wildly with it. They really surprised me in how well they already knew how to form the letters, though we've not done any formal lessons in writing. Shows you how much they naturally pick up on! When you live in an area that doesn't have the kind of trees that changes in the fall, you create some! I made these last year and don't know where I found the leaf images. I printed the leaf images twice. I wrote the type on the backs. Then, I laminated them for durability. 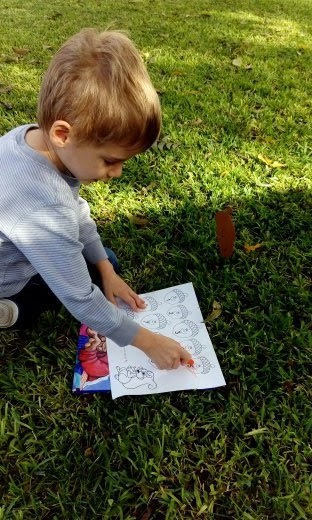 This activity is small enough to easily use as an activity bag when out and about. To use: Use these to identify the various leaves. You could also use these to develop description such as noting the shapes and color of each type of leaf. A third way to use these is to double print them to use as a matching game. I printed and laminated these cards last year. (I can't remember where I found them online- sorry). For my youngest ones, we simply used these to match. For my older one (and sometimes my three year old as well), we used them to introduce the game of Memory. I started out with just four pairs. As they got the idea, I added another pair. I think the important aspect of learning this game is to start slow so that it doesn't become overwhelming and they feel defeated by it. This was another activity that was small enough to be used as an activity bag (though, I recommend only taking a small set. The entire set would be way too many cards to be managed on-the-go). A fellow homeschool co-op mama introduced me to a flannelboard, and I've been in love with one ever since! For a fall flannelboard activity, we used felt scarecrows to go through the poem "Five Little Scarecrows." 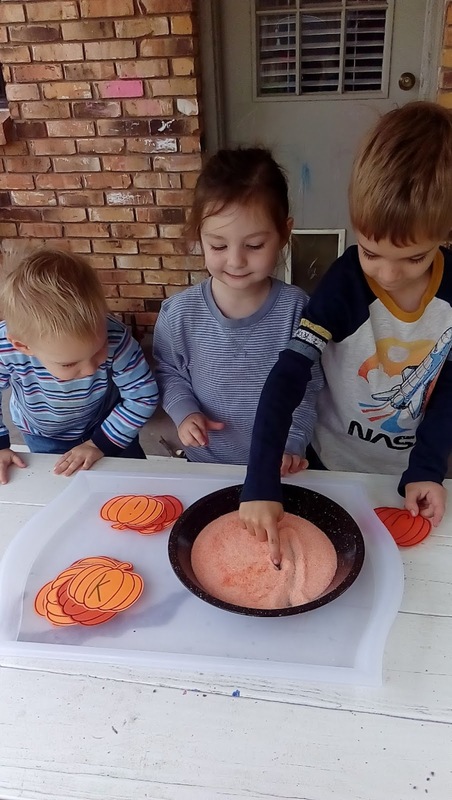 It's a fun, hands-on way to teach literacy (through the rhyme and rhythm of the poem) and math (counting, the concept of addition and subtraction). All the children were able to participate in this activity! Note- I discovered a new way of doing felt pieces. Print the desired image onto transfer paper, and then iron it onto the felt. Easy peasy felt pieces for the flannelboard! I found a friendly scarecrow image online, and thought it created the cutest felt scarecrow pieces! 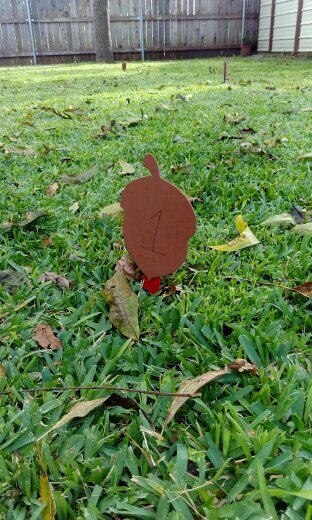 This number recognition activity was inspired by nature's preparation for winter. The words on the sheet read, "Can you help the squirrel collect all the acorns to store for winter?" I attached large craft sticks to the acorns and stuck them in the ground in the backyard. The children then were given a sheet and a crayon. 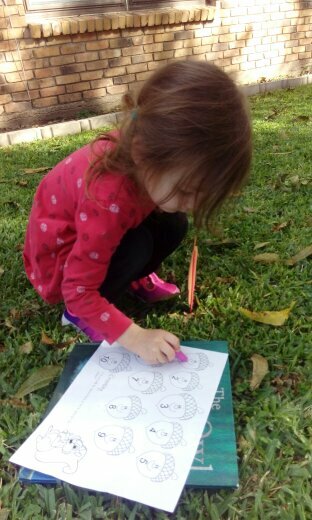 Each time they "found" and acorn they colored it in on their papers. It was a pretty fun activity to bring schooltime outside! We purchased each of the children a small pumpkin, and then enjoyed an afternoon on the back patio painting them! I have painted a pumpkin each fall for quite a few of my adult years, and it's always an enjoyable part of the season. This is one tradition I hope we continue for years to come! 11) Books, books, and more books! If we don't get to any schooltime activities, we at least have read several books. Books are central to our schooltime and family life. I love celebrating with books. Books are such a wonderful way to mark the beginning of a new season, a holiday or other occasion like a birthday. And so, I usually try to include a new book for us to enjoy. This year, I decided to get two books as my older two are able to understand books at a different level than my younger two. The older two received, The Berenstain Bears Fall Collection by Mike and Jan Berenstain*. And the younger two received, The Busy Little Squirrel by Nancy Tafuri* (board book). I collect seasonal books year round from online marketplace sales, library book sales, and used book store. We've grown to have quite a collection that we read over and over again each fall! 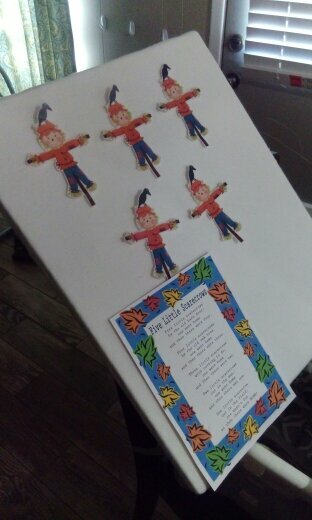 One of the mamas in our homeschool co-op hosted a fun fall gathering for us. She created a picture checklist of fall items found in nature. The children then went on a scavenger hunt in the backyard for those items. When they found the item, they checked it off their lists. It was a delightful way to incorporate nature into learning!